From 40 people to 40,000 people DJ PRIME has Rocked every show. DJ PRIME has a Nationally Syndicated Radio Show in 28 different Cities with an average listener base of over 15 Million listeners weekly. He is the Resident DJ in the #1 Rated Market New York City on WKTU 103.5 Every Friday Night. New York Giants & Jets Pre-Game Home Game DJ. 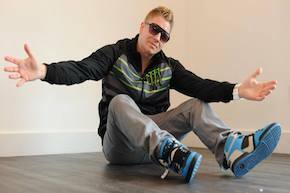 Monster Energy Drinks sponsored DJ to host events for the 2010/2011 winter ski season. With monthly residencies in New York, New Jersey, Connecticut and Pennsylvania and 1000’s of Gigs later, DJ PRIME has established himself as the hardest working DJ out there, maintaining over 275 shows per year. DJ PRIME has Toured/Performed with some of the biggest names in the Music Business Chris Brown, Sean Paul, T-Pain, Method Man, Enrique Iglesius, Taio Cruz, Pit Bull, Weezer , LMFAO, Cypress Hill , Dane Cook, 3oh!3, 50 Cent, Drake, Far East Movement, and Mike Posner, just to name a few. DJ PRIME has remixed tracks from Jay-Z to Kid Rock from LMFAO to Rihanna and has over 180 Remixes/Party Breaks/Blends and has sold tens of thousands of copies them worldwide.